On May 27-28 Sabine Krause and Maggie Walter kindly hosted a workshop on animal models for exon skipping in Munich Germany. Participants presented their latest findings under a confidentiality agreement. 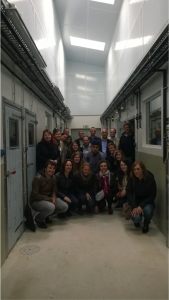 The meeting also included a lecture from Eckhart Wolf on pig models and a visit to the transgenic pig facilities. (Picture kindly taken by Virginia Arechavala-Gomeza).